Air Marshal Sir Geoffrey Dhenin, who died on May 6 aged 93 at home. Funeral service was on Thursday 19th May, 2011 at 10.15 am at Randalls Park Crematorium, Randalls Road, Leatherhead, Surrey. Donations to Alzheimer’s Society via F Harrison & Son, 40 Harvest Road, Egham, Surrey, TW20 0QT. He married, Evelyn Rabut in 1946, she died in 1996, and in 2002 he married, secondly, Sylvia Howard, who survives him with a son and two daughters of his first marriage. A second son predeceased him. In 1953 Britain undertook two atomic bomb test firings in the Australian desert, 300 miles north of Woomera. At the time Dhenin was serving at HQ Bomber Command as principal medical officer responsible for aviation medicine. He was also a pilot, and his appointment required him to fly the latest RAF bombers. When the first weapon was detonated, on October 13, Dhenin was already airborne at 30,000ft. As soon as the mushroom cloud developed he turned towards it and placed a wing tip, with a sensor attached, into the cloud to obtain radiation readings. Using special instruments, his observer calculated the probable dose rate. Once assured that the rate “would not be suicidal”, Dhenin turned for the centre of the cloud. It was very dark inside the cloud, and the aircraft was buffeted dramatically, but Dhenin was just able to maintain control. The transit was successfully completed and he made two further passes through the cloud, one through the top and one through the base, before returning to Woomera. 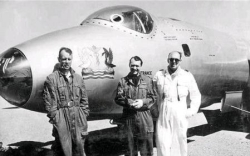 It was the first time that an aircraft had flown through a mushroom cloud. The aircraft was found to be highly radioactive, and other tests showed that the crew had exceeded the permitted radiation dose. Dhenin was summoned to the Chief Scientist, Dr William Penney, who congratulated him and then said: “Go home, boy. You have done enough. I cannot authorise such a thing a second time.” Although Dhenin and his crew had been scheduled to carry out the second nuclear test, they were withdrawn from the operation. Dhenin was awarded an immediate AFC. But in 1957 Dhenin was again called upon to obtain samples from a nuclear explosion. He flew a Canberra to Christmas Island, where he was “master sampler” for Operation Grapple, Britain’s H-bomb test. Three bombs were dropped by Valiant aircraft and Dhenin took off after the second detonation, on May 31, to fly through the cloud above 50,000ft to obtain radiation samples. For his work at Bomber Command and during Grapple he was awarded a Bar to his AFC. Geoffrey Howard Dhenin was born on April 2 1918, the day after the formation of the RAF, and educated at Hereford Cathedral School and St John’s College, Cambridge. He completed his medical studies at Guy’s Hospital in London. He joined the RAF in February 1943 as a junior medical officer and served on bomber stations in Lincolnshire. One night in October 1943, a Lancaster bomber had to return from a raid with an engine failure and crashed near the airfield, disintegrating and catching fire. Dhenin was immediately on the scene with an RAF Regiment gunner to find the injured rear gunner trapped in his crushed turret. Although there was a high explosive bomb in the blazing wreckage, Dhenin administered medical aid as he and the airman tried to release the man. For 30 minutes they worked in the intense heat before a crane arrived to lift the wreckage. Dhenin then crawled under the raised wreckage and released the gunner, one of only two survivors of the seven-man crew. Dhenin was later awarded the George Medal; his colleague received a BEM for gallantry. Two days after D-Day, Dhenin joined a mobile field hospital, and throughout the campaign in north-west Europe was involved in evacuating casualties by air. He was mentioned in despatches. In 1945 he trained as a pilot, and was one of a few doctors to be employed as a Flying Medical Officer. After serving on bomber stations and at the Institute of Aviation Medicine at Farnborough, in 1950 he joined No 1 Flying College Course for experienced senior aircrew. His ability was recognised when, on graduation, he was appointed to the staff. He then qualified as a senior specialist in radiology and in 1953 went to HQ Bomber Command, where he was the Deputy Principal Medical Officer (Flying). Dhenin commanded the RAF Hospital in Cyprus from 1960 to 1963 before returning to Britain to take charge of the hospital at Ely. In 1968 he served as Director of Health Research at the MoD and in 1970 was appointed Honorary Physician to the Queen. For three years from 1971 he was the Principal Medical Officer at RAF Strike Command, and during this period was elected a Fellow of the International Academy of Aerospace Medicine. In 1974 he was promoted to air marshal; for four years he served as Director-General of Medical Services (RAF), the first active pilot to hold the post. He was appointed KBE in 1975 and elected a Fellow of the Royal Aeronautical Society. Dhenin retired from the RAF in 1978 and for two years was Adviser, National Guard, Royal Saudi Air Force. A keen sportsman, he was president of the RAF’s Sub-Aqua Association and of its Judo Association. In 1981 he was captain of Wentworth Golf Club; he continued to ski until he was in his eighties. Geoffrey Dhenin was greatly admired by both the medical and flying fraternities in the RAF. His courage and flying skills had been amply demonstrated during the nuclear tests, and he continued to fly bombers for many years.